If you are cooking dried lentils, rinse lentils and place them in a large pot with 6 cups of water and a pinch of sea salt. Bring to a boil and then simmer for 20 minutes covered until soft. Drain and put aside. Make the marinade for the chicken by combining olive oil, lemon juice, garlic, turmeric, salt & pepper in a large bowl. Add the chicken to the marinade and coat well. Put the chicken aside to marinate for 15 minutes or more. In a large bowl combine lentils, red wine vinegar and olive oil, stir through to combine well. Add mint, spinach, spring onions, avocado, orange and blueberries to the lentils and toss to combine. Place a frypan on medium-high heat, once it is hot add in the marinated chicken breast. Sear for a few minutes on each side, then reduce heat to medium and cover until cooked through. While the chicken cooks, whip together yogurt, lemon juice, dijon mustard, salt & pepper in a small bowl. Once chicken is cooked, removed from the pan onto a cutting board and slice into strips. 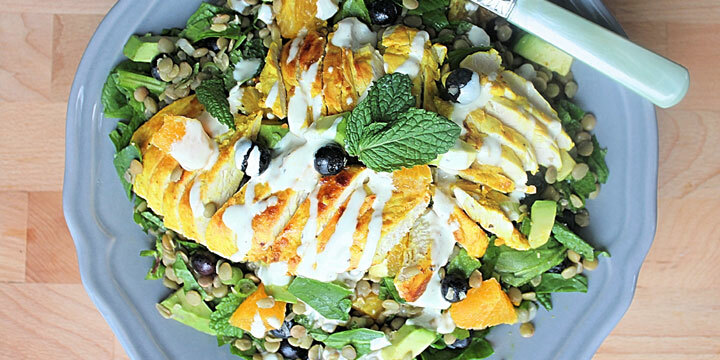 Add chicken to the lentil & mint salad and drizzle with lemon yogurt dressing. Enjoy!